Now let's face it.... we don't see too many of these around anymore. 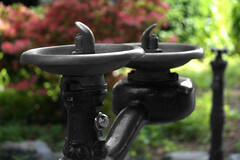 Nothing beats a "warm" stream of water from an old water fountain spigot on a hot day. Even the pump in the background is "functional" or at least appeared to be. Anyways, I wanted to keep the vintage feel of the spigot and pump, so I experimented in Photoshop and was content with this. There's still a sense of modernism witht he color I left in. I thought an all black n white or vintage sepia toned for the whole image would have been "cliche"